Flying is among the world population’s most common fears. According to the National Institute of Mental Health, somewhere between 2.5% and 6.5% of people have aviophobia, a clinically diagnosed, intense and irrational fear of flying. Many more, including a reported quarter of the American public, experience uneasy feelings during air travel. Those who have a fear of flying either fly uncomfortably or avoid air travel altogether. Perhaps even more challenging, the pathways to overcoming one’s fear of flight aren’t obvious. Short of scheduling time with a therapist, several coping mechanisms are commonly recommended by popular publications as viable solutions to airplane-related fears. These mechanisms include reading, practicing deep breathing techniques, listening to music, watching movies, taking sleeping pills, and having an alcoholic beverage or two. Forgive me if I question the healing powers of the travel-sized chardonnay, but measures that are more proactive do exist for addressing the fear of flight. Flight simulation, namely, provides a means for understanding, confronting, and overcoming the roots of one’s fear. 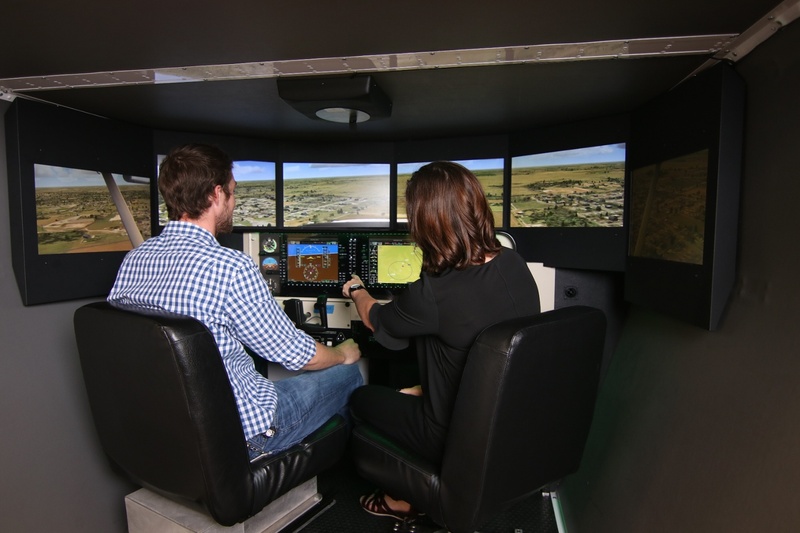 Flight simulation is interactive, and unlike coping mechanisms or traditional therapy sessions, flight lessons in a simulator can impart supplementary knowledge about the scientific intricacies of flight. A Certified Flight Instructor can utilize a simulator in a number of ways to address the concerns of fearful flyers. Conducting flight lessons in a simulator has several benefits. First, and most obvious, a simulator is realistic but ultimately less intimidating to a fearful flyer than an airplane. Moreover, in the simulator, pilots aren’t ineluctably put in the soup. Therefore, fearful flyers can gradually build to confronting their triggers. For instance, the instructor might start the lesson during the day, with clear conditions and no turbulence before moving on to IFR conditions and light turbulence. If the pace at which the instructor is progressing becomes counterproductive, then he or she simply can pause the flight and adjust the scenario. In addition to creating a comfortable learning environment for the client, this approach also clarifies the root of the client’s fears. In an airplane, several variables to the client’s phobia are uncontrollable. In the simulator, you can disable the motion and turn off the sound. You can simulate actual emergencies without causing heart attacks. The instructor can create several scenarios and tests to identify from where the client’s fear derives. Then, he or she can explain and demonstrate how the client’s concerns are explainable by science, math, and standard operating procedures for aircraft. A hands-on simulator lesson also allows you to feel the forces of flight in action. Release your hands from the yoke briefly and watch as the aircraft continues its forward momentum. Reduce speed and feel the aircraft begin to descend. It’s a lot easier to imagine the plane going down. A flight lesson in a simulator helps remove abstraction by bridging cognitive and motor functions. As the client flies the simulator, the instructor can explain how his or her actions are balancing the other forces of flight—how the flight controls always keep the pilot in charge of the aircraft’s fate. MIT neurologist Earl Miller has a helpful analogy for explaining how the conscious brain functions. Dr. Miller compares the brain’s prefrontal cortex to a railroad switch operator and the rest of the brain to railroad tracks, noting how a switch operator “activates some parts of the track and takes the others offline.” Essentially, while the human brain can store an almost unlimited amount of long-term memories, the conscious brain is extremely limited in the information it can hold at once. So, even though a fearful flyer’s brain may understand the physics of flight, it’s consciously fixated on the threat that phenomena like steep turns seem to present. Overcoming this can be challenging when the task at hand—consciously understanding how flight works—isn’t physical. Turbulence is a distraction that we feel, but rationalizing air travel isn’t a task we can feel. Thus, the goal of the simulator session is to create new memories that are positive and vivid enough to avert the client’s focus from fear. Then, the new memories can be stored on the cusp of the client’s awareness in working memory, from where—according to Miller—he or she can pull them into the conscious mind as needed. To accomplish this, the flight instructor will help the client associate his or her triggers with positive outcomes. For example, if turbulence triggers fear, then a flight simulator lesson could demonstrate to a fearful flyer that flight continues normally despite increasing exposure to turbulence. Additionally, the instructor can help rationalize the client’s comfort as it develops. For instance, the turbulent flow experienced at high altitudes is similar to the flow over a golf ball, ocean currents, or the smoke rising from a cigarette. It’s wind and it’s natural. The instructor can point to the altimeter as proof that the sensation of dropping from the sky is unfounded. This episode of Flight Chops is a great demonstration of how the simulator can help fearful flyers confront their fear triggers. If a flight school isn’t already offering introductory lessons tailored to fearful flyers, then it really should consider it. From a business perspective, it’s a low risk, high reward endeavor. At worst, it’s a one-off transaction no different than some other introductory flights. At best, it’s an untapped market. That may seem like a stretch, and former aviophobes obviously will never constitute the majority of a school’s clientele, but it’s at least conceivable how and why people who have overcome a fear of flying would want to continue their aviation journey. Fear extinction requires the creation of a conditioned response that counters the conditioned fear response, and since fear is a deeply emotional feeling, the new response rarely is rooted in apathy. Individuals who overcome a fear of flying often have a newfound appreciation or even enjoyment of flight. To maintain their confidence flying, many are also prone to continue learning. Overcoming fear brings tremendous relief, and it's natural to continue exploring one's boundaries to proactively prevent feeling extreme inhibition again. Fear also grooms some of the best pilots. After all, fear is an emotional response that’s meant to help keep us alive. Physiologically speaking, the difference between an alert pilot and a fearful flyer is actually pretty simple. 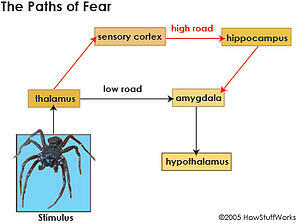 It depends on how the amygdala processes anxiety. If the amygdala alerts the hypothalamus to a potential threat, then the body tenses and speeds up in a manner that can be counterproductive and debilitating. However, if the path of fear is routed through the sensory cortex, which is more rational than emotional, then an individual’s senses will heighten and they’ll be able to assess the threat based on past experiences. In essence, with the sensory cortex at the reigns, an aviator actually can approach aeronautical decision-making with more clarity. Fear can be incredibly useful and even life-saving in aviation. The stipulation is how we experience fear. With a well-tailored education and exposure to fear triggers, even people with severe aviophobia can begin to manage and repurpose their fear. Maybe they’ll even repurpose it from behind an aircraft’s controls.